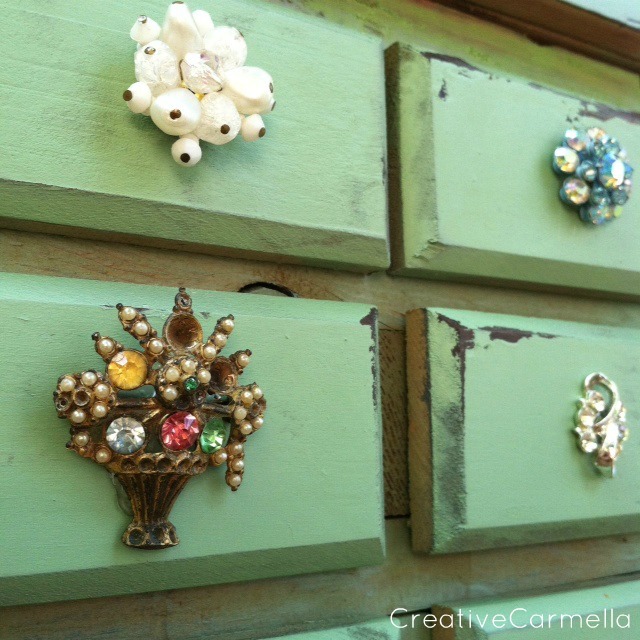 Evey's Creations: Ms. Creative Carmella visits!-Jewelry Box makeover! 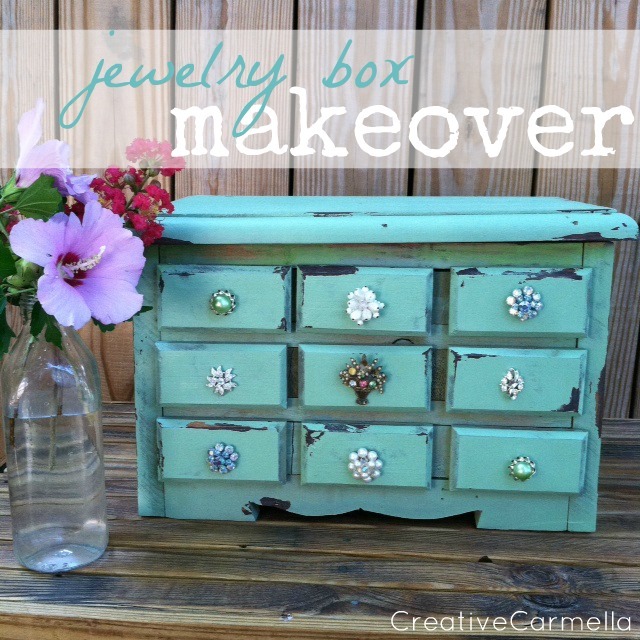 Ms. Creative Carmella visits!-Jewelry Box makeover! Hi, y'all! Today I get the privilege of introducing you to one of my favorite people EVER! :) Ms. Creative Carmella! I know I say it often, but I truly love her and her incredible pieces of jewelry! Make sure you check out her online store! She's sharing a lovely project with us today! Enjoy! 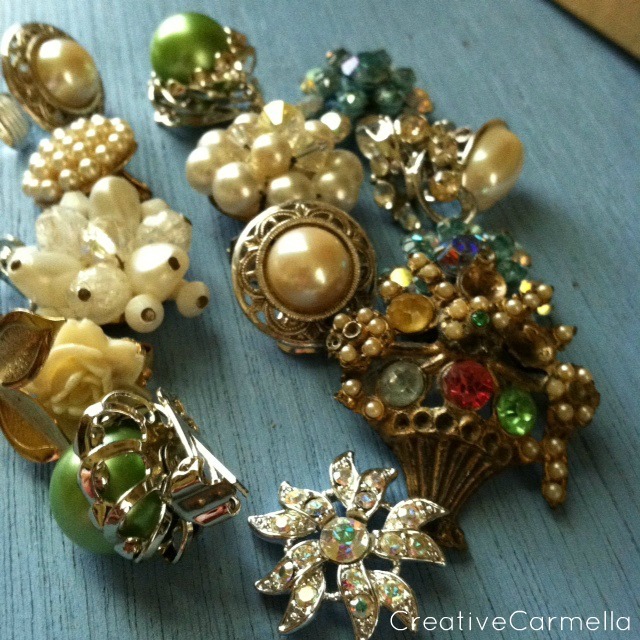 I am Carmella the voice and artist behind the Creative Carmella blog and shop. On my blog I share stories from my world, crafts, and all things creative. Today, I am happy to be filling in for Evey while she is in recovery mode. Every girl needs a little Bling in her life, right? And to think...this blinging jewelry box started out pretty plain, I picked this one up at my favorite local vintage wares shop, Junk 'N' The Trunk. Handmade, heavy! and full of possibilities..... I couldn't wait to get my hands on it! "Come on people!! I have a plan!!" I kept wanting to say, but I kept my mouth shut and went right on working. Do you know what my favorite trick is for distressing small pieces?? Weird, right? But it works like a charm and I don't ever use any sand paper at all. none. not one little bit. To do this technique you just need to put a small amount of Vaseline over the painted areas where the distressed look would happen naturally.... just make sure you only put the Vaseline where you want the dark paint to show through in the finished piece. I used satin finish, "Pistachio" Krylon. Now, time for some BLING! Even the flowers perked up when they saw all that bling!! Evey, Thanks so much for having me!! I hope you are feeling much better soon! Thank you so much for sharing your process! It is just beautiful. I have collected four jewelry boxes from thrift stores but they are not unfinished like this one. They are the ugly dark brown with the velvet inside. Any tips on how to not get paint on the velvet? Thanks so much! Love that idea. I may give it a try myself.